If you are an avid Mac user you may occasionally bump into the problem of too many windows all over ther place. 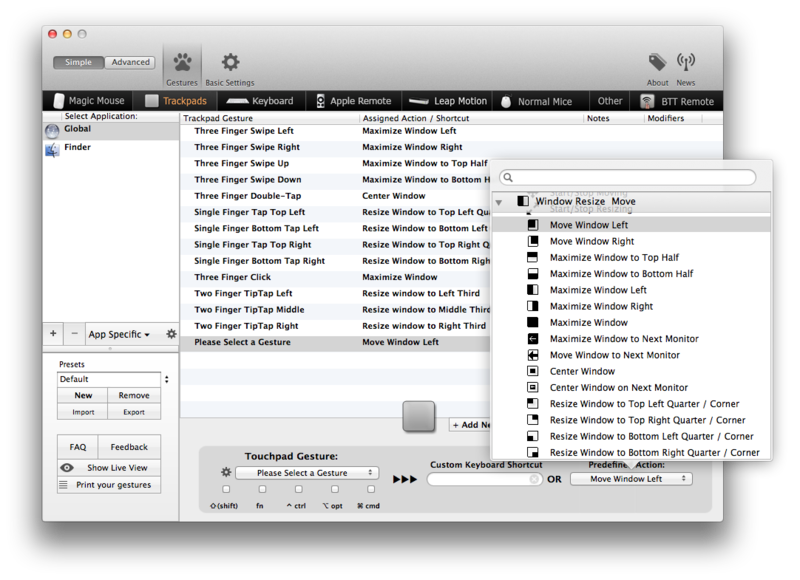 When that happens it would be great to have a window management tool to quickly move windows where you want them to be. I review three free apps here that can help out. If you just want to be able to maximize your windows to the right, left or fully with the keyboard then TileWindows Lite is the way to go. If you want more control such as being able to resize windows to corners and center them with the keyboard then ShiftIt is a better tool for you. BetterTouchTool is an awesome tool if you are willing to spend some time going through the preferences and setting up your shortcuts. It also comes with window snapping making it the only tool you really need. 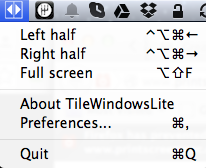 TileWindows Lite manages windows through keyboard shortcuts. It’s very simple. It’s small and easy to install. Once you start it it will show up on the menu bar. Following the simple theme, the preferences are pretty, well, simple. 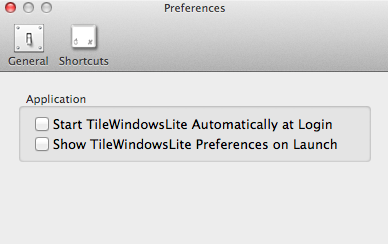 TileWindows Lite also gives you the ability to customize the keyboard shortcuts. If all you need is to align things to the left or right in half screens, or make things full screen then this is a perfectly suitable tool. If you need more options then look at the next tool. Another free keyboard shortcut windows management tool. This one is opensource though. Toggle Zoom is like pressing the green button at the top left. Maximizes makes the window as big as the screen. 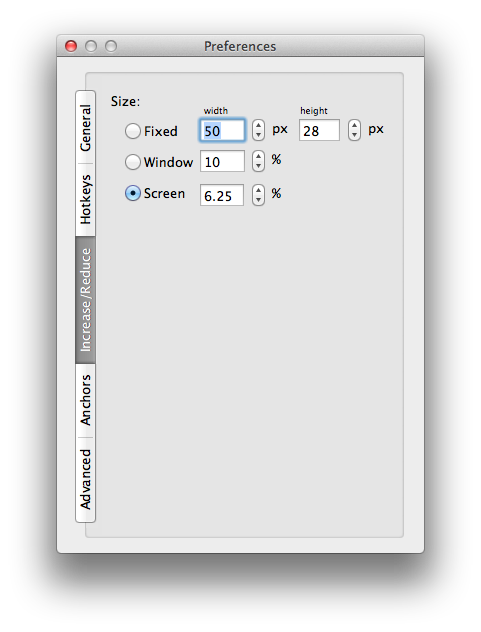 I found increase and reduce to be very useful; they incrementally increase or decrease the width of the active window. I loved the quick and easy minute controls. The preferences window have several tabs, which are listed vertically making them pretty hard to read. I thought that was pretty unusual. 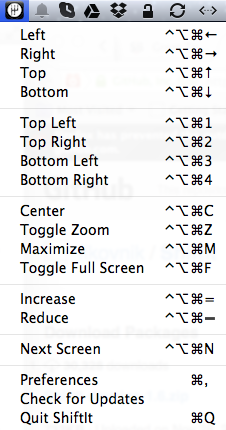 As expected the preferences give a lot of options including full customization of the keyboard shortcuts. You can also control the increments used in the increase and reduce functions. 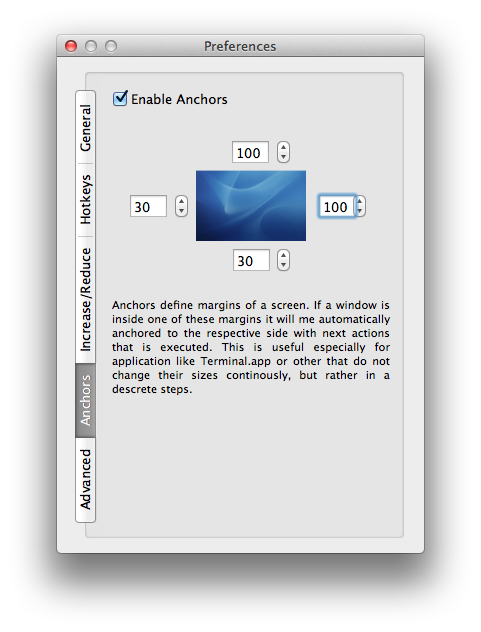 The Anchors tab gives you control over how big of a margin you want on your screen. However, no matter how many times I tried to use it, I couldn’t get it to work. I am running an older version of OSX so that may be the problem. I love this tool. It has a lot of options and gives the user a lot of control and customizability. Let me just say this, I love this tool. 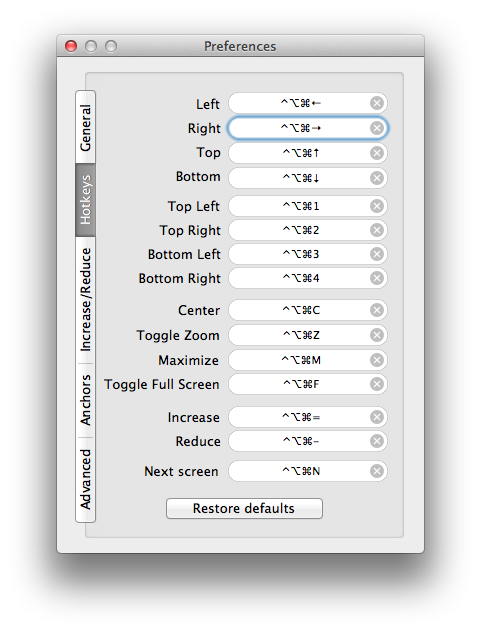 If you are a real control freak, a bit like me, then BetterTouchTool (BTT) is the tool for you. Once I launched BTT I was a bit taken aback by the sheer number of things that I could do, and well, had to do before this tool could be useful. This is not a plug n play tool like the previous ones. 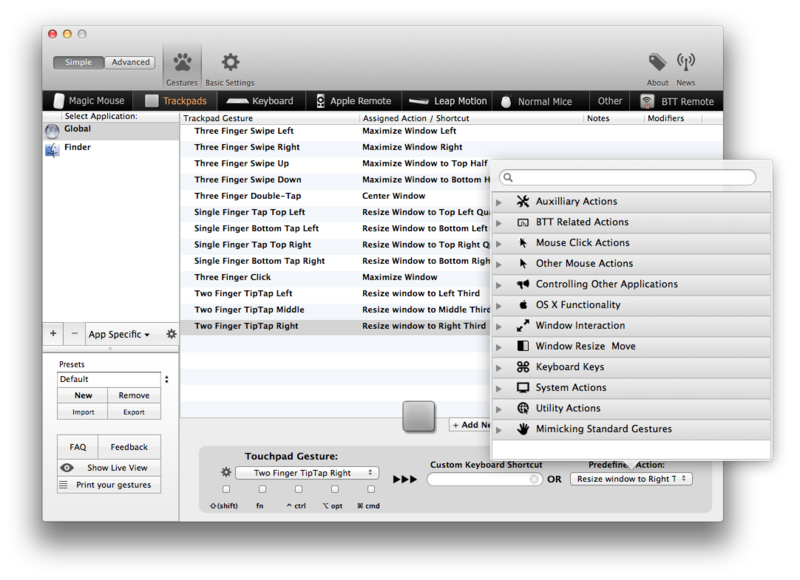 Basically BTT lets you choose gestures from several input devices and attach one or more actions to it. The level of control is awesome. However, there are no presets so it needs some setup. For our purpose I was interested in the window resizing options, which inlcude almost all of ShiftIt’s options and a few more like putting the window in the left, middle or right third. The options missing were the increase and reduce functions of ShiftIt, which I thought was unfortunate as I really loved that control. I loved this tool for the sheer amount of control it gave me over my windows. Furthermore, its usefulness went beyond window management because of all the other actions available. If you are willing to sacrifice some time to setup the presets and like the control then this is the tool for you. This entry was posted in Miscellaneous and tagged Mac, Windows Management.